I thoroughly enjoyed Jabari Asim's collection of short stories set in the fictional (St. Louis-inspired) Gateway City, A Taste of Honey. I picked it up on a whim at the library, and it was one of my favorite reads of 2014. A couple of weeks ago, the library had Asim's newest book on display, so I immediately picked it up. Only the Strong is also set in Gateway City, though most of the action is in the 1970s, vs the 1960s setting in A Taste of Honey. The set-up is similar, though. 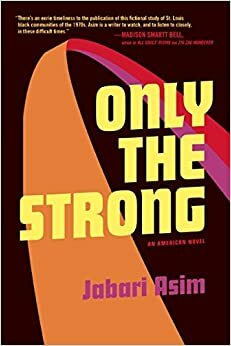 While Only the Strong is hailed more as a novel, it feels more like three novellas, each one picking up where the last one left off. The first section features Guts Tolliver, a man in love who still carries the weight of his past misdeeds. The second section focuses on Dr. Artiness Noel, a prominent doctor locked in a long-term affair with a gangster; and the third section is told from the perspective of Charlotte, a foster child whose world opens up when she goes to college. I enjoyed this novel just as much as I enjoyed A Taste of Honey. The characters are just as flawed but truly well-meaning, the tight-knit community and the relationships that form between people are at the core of the story, and the setting of Gateway City is just as much a character here as it was in the previous book. My favorite character in this book was Guts Tolliver. I loved spending time with him, and every time he would pop up in the second and third sections, I would be thrilled to see him again. He really exemplifies what happens to good people who feel like they have no choices, or who feel like life just isn't fair. And he just does down a dark hole and then struggles and struggles to come back up and redeem himself. The entirety of his life story is just so sad and then so sweet and then just absolutely beautiful, and I love Asim for bringing Guts to life in such an empathetic manner. Both Dr. Noel and Charlotte's sections were excellent, too, though. I enjoyed reading about how Dr. Noel worked so hard to become such a prominent physician, and all the sacrifices she made along the way. I loved how passionate and excited Charlotte got when she went to college and learned SO MANY THINGS and met SO MANY PEOPLE. It can be a heady experience, and it was fun to go through it again with Charlotte. I would not say that this novel is a companion to A Taste of Honey. You can absolutely read one without reading the other, and while some of the characters overlap, I don't think you miss anything if you read one and not the other or read in whatever order you would like. I hope some of you give Asim a try. I have really enjoyed his books, his writing style, and especially his characters. I so look forward to more from him. Hopefully, his books will continue to be prominently featured in my local library branch! I will absolutely "give Asim a try." I am very interested in the characters you've described. Thank you for introducing me to him. Like the cover! I'm trying to think if I've ever read any books set in 20th or 21st century St. Louis. I'm not sure I have. Your description of this book really intrigues me - thanks for the recommendation! Sounds so good! I have his N-Word and Not Guilty on my tbr. I'll take a look at his fiction stuff as well, seems to me he deals with similar issues there.